Thanks again for the rental and tech services you provided at my wedding on the 18th. Everything went smoothly and the music sounded great; also, Rich was very helpful and friendly. First of all I wanted to thank all of you and especially MC Kaz as well as DJ Akshay for their exceedingly professional demeanor and outstanding effort in complying with our wishes. They were instrumental in helping me make my sister's wedding a success. Once again I'd like to thank you guys for all your hard work as well as their help and consideration during the two events we had hired DJUSA for, they were awesome! DJ Akshay rocked the boat. He was with us to help with the music for all our events aboard the cruise and helped to make sure each event, ceremony, and performance went smoothly. He worked well with other vendors and was able to solve many problems calmly and quickly. He was on time, respectful to all our guests and their requests, and we truly felt he was part of our family. 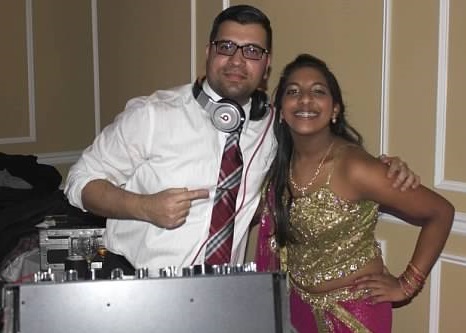 Akshay is a great DJ but also a good person who I would feel comfortable DJing any of my events in the future. the staff and all etc etc. I just wanted to send a note to personally thank DJUSA for making our wedding reception so fantastic. Max was amazing as the MC - hyping the crowd up, taking the time to pronounce everyone\'s names, and also managing the reception schedule and improvising with the program when the food was coming out a bit late. He told us what was going on, and totally winged it to make the flow of the program go smoothly. I loved that and didnt have to worry about anything. He was a total professional and knows Malu weddings! So happy when he sang Range Barse, too! DJ Akshay totally killed it - the music was awesome! He played everything we wanted and added in some more. Our dance floor was packed the entire night and we loved that. I am so glad we picked him! Savin and I were both impressed from the get-go with your company. Your detailed reception template was on point. It made everything super organized. We can see why you guys have a great rep. I know many people complain about services, but not many people actually tell you what a great job you are doing. Just wanted to pass on note that to say what an amazing job your team did. Please also pass this on to Max and Akshay. Thank you for making our night so memorable!! 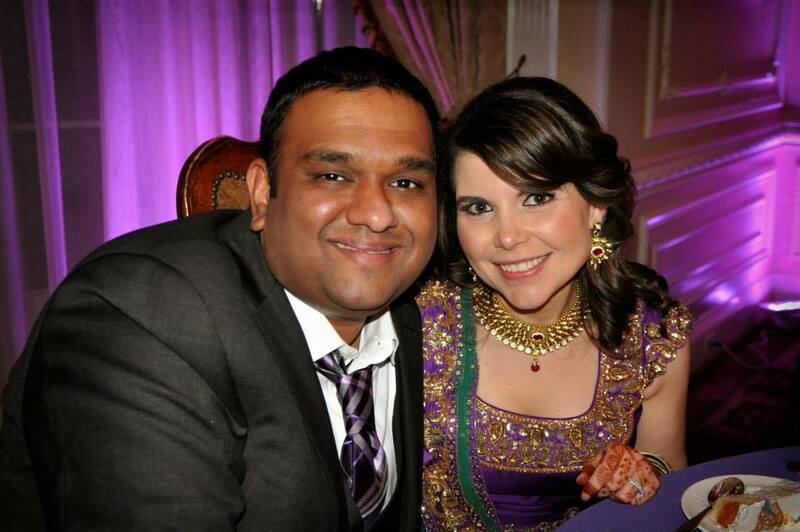 Mel and I just wanted to say thanks again to you and Sharad. People are still talking about the party and how the dancefloor was packed the entire time (thanks to Sharad\'s ability to read and fire up a crowd). We also LOVED the photobooth photos. If there\'s anything we can do for you guys, just let us know. The DJUSA team was amazing! They truly care about their clients and what makes them really happy. Contract included; ceremony DJ Rohit, 30 uplighting fixtures, 2 intelligent towers, bharat van, dhol player, and everything else you�re about it read. Once the contract was signed, I worked with Nisha Bhavnani, she was absolutely magnificent. We exchanged countless emails, multiple calls; she gave me plenty of brilliant ideas and helped me ease the stress. THANK YOU! GOBO: Paul Motisi; when I say this man has patience of a saint is an underestimate. We never really knew what we wanted, but he helped us see a vision and create something from scratch for us and relentlessly updated the GOBO until we absolutely LOVED it, which speaks volumes to the customer service. The best part, during the begin of the reception the GOBO was stationed on the dance floor, once the dancing started, it rotated on the wall throughout the entire ballroom, so many of our pictures have our GOBO design in the background, which was absolutely brilliant. DJ JUICY: I won�t lie, I�m very particular and was very nervous, I specifically picked Juicy, having never heard him live and basing my decision on recommendations and listening to his DJUSA clips. Picking a DJ, can make or break your big night, hands down one of the best decisions I made! I live in DC but the wedding was in NJ, managing to make it to the DJUSA office in Long Island was rather difficult but the staff never made it an issue. Nisha set up a FACETIME meeting so I can �meet� the DJ before the big day and go over the timeline and overall vibe for the night. At the reception DJ JUICY, killed it, to say he was amazing is an understatement, he blew it out the water, and even my parents were so impressed and happy with my decision. He was on point with every cue, every song, and he without a doubt knows how to get the crowd going. Thank you a million times for making our big day the best night ever, couldn�t have done it without you! Do pass on my compliments to them for the excellent..excellent service,timely setup and a wonderful job. Truly appreciate the talented team and thanks for making the evening special. I really wanted to thank you both for all your help! Ashley's party was a huge success and it couldn't have been done with you! Everything looked so great and we were so pleased with everything - the lighting, DJ, banner etc. The entire production exceed our expectations. The music was awesome! Everyone was dancing the entire night! Even with the last minute change Gino really came through. The whole crew was amazing and they really worked so hard! We are so happy that we partnered with you and we hope to work with you again soon! It was fantastic working with you guys... the party was amazing... looking forward to our future events together. We can\'t thank you and DjUSA team enough for the awesome work. DjUSA team rocked our wedding. Amazing job. Already starting to refer you guys to people we know. Hope your 2014 is off to a good start! I want to THANK YOU and your team for your incredible work at our Wedding Reception! The night was an evening to remember. The music selection, the MC\'ing, the lights all set the background for a memorable evening which both looked and sounded fantastic! Many of our guests have been talking about how awesome the music was and how on point you were in setting the mood at all times! It has been been such a pleasure working with both of you! You professionalism is admirable and one that made the planning a lot easier for us! I am really glad Raj recommended you and that we had a chance to work together. THANK YOU AGAIN for making our event so memorable. We hope to have the opportunity to work with you again! I received you post event questionnaire and will be sure to fill it out and send it back your way. Wish you both a amazing 2014! Just wanted to say thank you very much for taking care of my event and setting up everything for me. 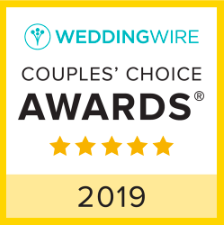 All the DJ services were excellent and really made my wedding events outstanding. I really appreciate your time and am looking forward to working with you sometime in the future! Before we head to St. Maarten for our honeymoon tomorrow, my husband (!) Brian and I just wanted to say how wonderful Kaz was at our wedding. He was THE PERFECT match for us and kept the dancefloor packed and fist pumping ;) the music was incredible and everyone was commenting on how much fun they had at the reception, especially my dad or "Usher" as Kaz likes to call him (my dad loves Usher...thanks to me! haha). Please let us know how we can recommend you and the team to our friends and family. We're so happy to provide a testimonial, etc., just let us know! Thank you again for everything! Talk to you soon!